NVIDIA is holding its annual GPU Technology Conference (March 18-21), which means that long-awaited information on its future products is finally coming out. The Tegra platform for tablets and super smartphones is, as always, one of the bigger subjects. 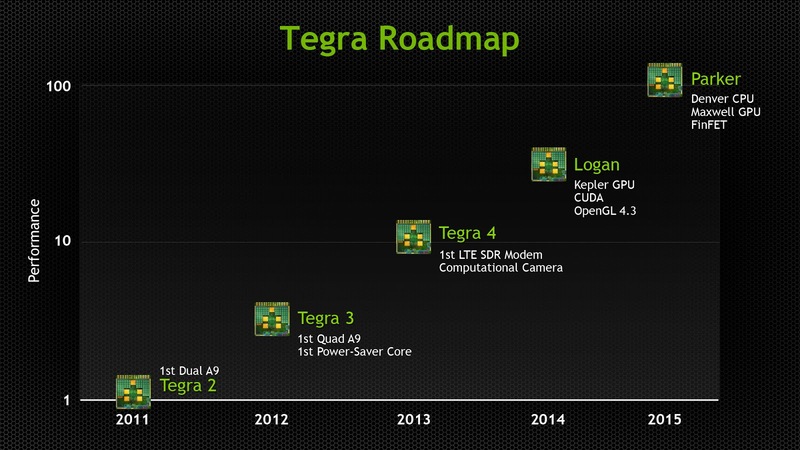 As the slide above shows, the Tegra 4, with its computational camera and LTE support (and which is already out) will be followed by the Logan. After that, will come the Parker, which makes us wonder if “Strong” was just a fake rumor all along. Tegra 6 Parker will get a Denver CPU, a Maxwell GPU and FinFET transistors. It will debut in 2015, which means Logan (Kepler GPU, CUDA support, OpenGL 4.3) will have 2014 all to itself. Given the tendency of Tegra SoCs to get stronger with each generation, it is unlikely that they will be used in smartphones at all. Tegra 4i will need successors of its own.